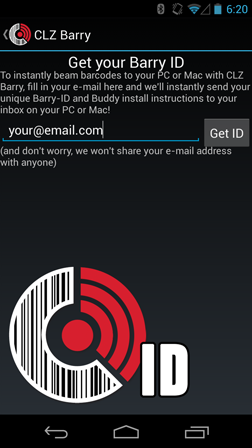 To connect your CLZ Barry app to your desktop computer, you need your own unique Barry ID. Just request a Barry ID from the app’s settings screen, then fill in the same Barry ID in the Barry Settings screen on the desktop side. The generated Barry ID will now appear at the top of the Settings screen. It will also be sent by email to the email address that you entered.